It's your aptitude, not just your attitude that determines your ultimate altitude. Or is it vice-versa? It's your attitude, not just your aptitude or a mixture of both that determines your ultimate altitude? Wonder which theory applies to those few players who have been, are and could be the members of the Indian squad! Take the case of the wicketkeeper. Isn't it a tragedy of Indian cricket that we have been unable to a find a top-notch wicketkeeper? The sad news is if we find the guy with the perfect aptitude for the thankless job in cricket, his attitude seems all gone awry! And the person with perfect attitude doesn't have the finesse or talent to be among the best! I look at Andy Flower and Adam Gilchrist (who is one of my favourite cricketers) and a thought comes to my mind: why, oh why, don't we have one in India? Is it really that impossible to have one? Sigh! I caught a few glimpses of the recently-concluded Irani trophy match and Nayan Mongia was at his usual best behind the wickets (which included his excessive appealing behind the stumps and his very famous "aai ga"). Today in India we have no option other than that guy; and what is coming in his way is his own attitude. I won't defend Mongia's attitude of late. To put it simply, it's frustrating! I'll give you a small instance. Remember the drama during the last over on Day 2 of the First Test between India and Australia at Bombay? Mongia got hit on his finger, on the first ball of the day's last over. Instead of playing out the remaining balls calmly, he refused to play any further! Sachin walked in for the last five balls! Agreed the ball hit him severely; agreed the injury could have got critical. But with five balls remaining, how serious would it really have got? Couldn't the guy stand there with a bit of determination, a bit of heart, a bit of 'positive' attitude and go through for the remaining five deliveries? For heaven's sake, it was the Wankhede pitch not the Perth wicket!! 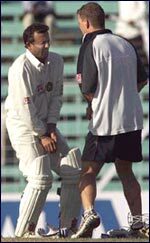 Sachin must have surely told himself that I'm batting tomorrow, but now had to go because Mongia had come back with unfinished business! It's no big deal for the little master to switch his mindset, but the question arises,did Mongia do the right thing? You ask me, I say no! Somebody once said, "Nothing can stop the man with the right mental attitude from achieving his goal; nothing on earth can help the man with the wrong mental attitude." Have you heard it Mr. Mongia? Will you please change? Else can we find somebody who will take Mongia by the scruff of his neck and make him see sense? Any takers? A desperate plea, because we seem to have no other wicketkeeper to match his class, atleast at the Test level! As much as I like Dighe's attitude he just doesn't match up to Mongia's skills. Mongia is also a better batsman than Dighe. Of all that the nation has seen of Dasgupta, he looks good, but needs time to come good, especially at the Test level. Gilchrist was an understudy to Healy before he adorned the Test gloves after playing 79 one-day internationals. See what the experience of being with Healy has done to him. Maybe he isn't as yet in Healy's class, but he is going great guns isn't he? I'm not asking for every guy to wait 50-odd one-dayers to wear the gloves for Tests, but a little experience would help. I can't recollect the last time we went with two wicket-keepers on a tour. Why do we neglect this aspect so much? If there is an injury to the main guy, then Dravid is always there! (I won't be surprised if Sachin does that job, that's one thing he hasn't tried his hand at, and, mind you, he just might be good at it) My point is: if Dasgupta/Ratra go as understudies to senior wicket-keepers (I know we have none there too) on few tours it will do them good and build them up for tougher battles ahead. Well, not many will agree with this, but till these young guys mature, give one last chance to Mongia. If he isn't penitent even now, well it is everybody's loss! But, if you are not ready to take Mongia, at least don't sack Dighe for no apparent reason. Age? Did I hear age was the factor why he was dropped from the side? And didn't John Wright and Sourav once say they want the players with the right attitude? So somebody please explain what are Srinath and Prasad doing in the side? Why is Robin Singh not around? If he doesn't have the right attitude who does? Or do we have different definitions for the word for different people? Aren't we being hypocrites here? Prasad has the heart but his pace is gone (Was there any before?). He is a good cricketer but his bowling is just not up to the mark anymore. Srinath is as old as Dighe and a chap with a defeatist attitude! Please sir, will you mind stepping aside now. Haven't we seen enough of your thoughtless bowling? Or do you intend to inflict upon us some more torture! Even a Mohanty will bowl with more sense on those fast tracks! I would hate to see Zaheer, Nehra, or Agarkar (based on the recent form he has shown in the series) sit out of the squad in order to accommodate you. 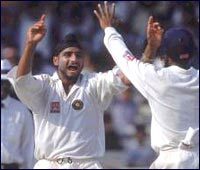 As it is, it's very likely that Harbhajan will sit out for Kumble. I would have a chap who will bowl more consistently, tease and torture the batsman, rather than somebody like Srinath who gets five or more wickets once in a blue moon to secure his place in the side. 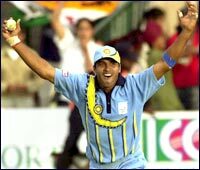 Yes, if we talk of attitude, I'd like to see the Indian team go without a Srinath! No, not because he is injured but because there are more deserving bowlers in the side! Ironically, we have won matches in better fashion when our "Mr. Spearhead" was sitting out due to injuries. Another aspect that bothers me is finding a good all rounder. I'm not saying genuine or great because there don't seem to be any around at present. We have to develop one. Yes Ajit, I'm still waiting; I have oodles of patience, the guy of whom Kapil Dev had said, "I remember my earlier days when I see him." Yes, we are waiting to see if you turn out even a little like him, if not entirely! (No one is doubting your "attitude", your fielding is class, but can we see more consistency in your performances with the willow and the red cherry please? Oops! I hope I didn't sound like Siddhu there.) We do need an all-rounder desperately, to bring the right balance to our side. And in him we need the perfect combination of attitude + aptitude! The present team definitely has a lot of people with the right approach, with their heart in the right place and we hope they maintain it. The likes of Harbhajan, Sehwag, Yuvraj, Sodhi lift the morale of the team with their little contributions with the bat and ball, and fielding, because they give it their all. But everyone has to have it, not just a few! It has to be developed from the domestic level not after you come to the international scene. (Some never develop it at all is a different story altogether). Unless there is an attitude change among the selectors, administrators and domestic players, no amount of aptitude is going to help Indian cricket. We can't expect instant changes to the fortunes of our team. Unless we find 11 Sachin Tendulkars, of course! Albeit even he has been unable to change India's fortunes, the reason being he never had the other 10 sharing the same attitude as he. Even if the remaining 10 are not as talented as him but are on par regards his attitude, it will be just the right team we need. Among the present lot, many are showing signs and if only it rubs on to the next set of cricketers, we shall have the right people playing with the right objective. Is that the reason why Australia finds itself at the zenith? Is that the reason why India finds itself somewhere in middle because it has a mixture of both? And, if we finally get untainted positive players will we ever manage to achieve one-tenth of what Australia has? P.s: Another 'A' Factor we should be worried about. The Indian team seems to suffer from occasional bouts of 'amnesia'. They just forget to do their basics right. If our bowlers stuck to the right line and length, (Is it really that difficult to probe around the off-stump, to simply pitch it up? Glenn McGrath and Pollock do exactly that, don't they?) the batsmen improved their running between the wickets, (Watch the Aussies' video-tapes, watch Bevan!) and fielders fielded with a little more passion (Try at least one-tenth of what Jonty does, just try!! ), would achieving consistency in performance be difficult? The last two aspects rarely feature even in our victories! I'm not expecting victories, but some level of consistency. I definitely didn't expect "This Indian Team" to lose to Kenya! They will comeback strong and I have no doubts about that, but they just keep proving my point, indubitably they suffer from amnesia! There seems to be no other explanation for their inconsistency! Mr. Leipus maybe you need to resort to our Bollywood or Hindi serial directors, they have innumerable remedies for recovering from amnesia!! Editor's note: Rediff believes that like its own editorial staffers, readers too have points of view on the many issues relating to cricket as it is played. Therefore, Rediff provides in its editorial section space for readers to write in, with their views. The views expressed by the readers are carried as written, in order to preserve the original voice. However, it needs mentioning that guest columns are opinion pieces, and reflect only the feelings of the individual concerned -- the fact that they are published on Rediff's cricket site does not amount to an endorsement by the editorial staff of the opinions expressed in these columns.